Some Things Just Say "Hack Me"
Everyday I pull into work I see this sign. 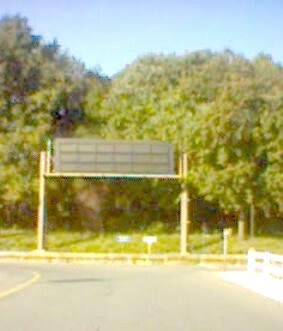 The sign is of the type you typically see over an interstate highway, but this one sits at the end of a road, behind a government office building that leases space to private companies. I’ve often wondered why the sign was here - at the end of a road with nowhere to go but a parking lot. I’ve never seen a message appear on the sign. I don’t know who controls it. I’ve concluded someone in the government needed to spend some end of the year money in order to pad next year’s budget. The other day as I was leaving, the sign spoke to me in a clear voice. “Hack me”, the sign said. “Make me display something funny. I want to make people laugh”, the sign said in a firm but pleasant tone. “Hack me”, it repeated. It took me a moment to gather my thoughts. I’ve amused co-workers with printer tricks, but this was a tall order. About 35 feet tall. “You’re nuts”, I replied to the sign. “Most of the people around here are government bureaucrats – they have no sense of humor. I could get into big trouble”. The sign spoke in a soothing, almost hypnotic voice. “You know you want to do it. You want to find out how to light me up. It’s been a long time for me…”. The voice faded, then returned in the kind of soft, neutral voice that only a talking sign could have. “Hack me in the old-school sense of the word, you know you want to do it”. I paused to think again and began to feel uneasy. What if someone saw me talking to this sign? Not everything in Columbia, Maryland is as it appears. Why, just around the corner behind a second tree line is a large, unnamed brick building with few windows, two layers of barbed wire fence, and cameras every 200 feet. The NSA moved in, some say, but no one really knows. Someone could be watching. I moved to my car and tried to ease the sign’s voice out of my head with talk radio. As I pulled out of the parking lot and headed towards the highway, I began to feel I was driving suspiciously slow. I decided I needed to blend in. On the entrance ramp, I slammed the accelerator to the floor and veered hard to the far left lane, all the while gesturing rudely at the faceless cars around me. I felt more inconspicuous with this behavior, which is typical among the breed of commuters in the Baltimore / Washington DC corridor. My thoughts returned to the sign on the drive home. If the opportunity presents itself, I thought, I should at least have some idea of the message I’d put up. Typically, these signs display something obvious and completely unhelpful. Like when you can see nothing but the brake lights of stopped cars in the distance, these signs will display “CAUTION : CONGESTION NEXT 2 MILES”. A message like “CAUTION : TREES AHEAD” would be exactly the type of message people would expect to see on a highway sign in front of a forest on a dead end road. It might be so obvious and so un-helpful (in other words, so sign-like), that nobody would ever notice. Nobody except me, of course, and the lonely sign. Not that I'm ever going to touch the sign. Never. Ever. If you had a giant sign outside of your office, what would you make it say? I hate it when signs and other electronics start speaking to me like that. <br>I'd probably go with something boring, and old school..
<br>Users come and go, but schemas are forever.